August 24, 2017 By arzea 60 Comments This post may contain affiliate links. Read my disclosure policy. 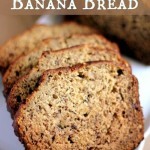 This is the Best Banana Bread EVER!!! It’s moist, delicious, and SO easy to make! With only a handful of ingredients needed, this whips up in no time! 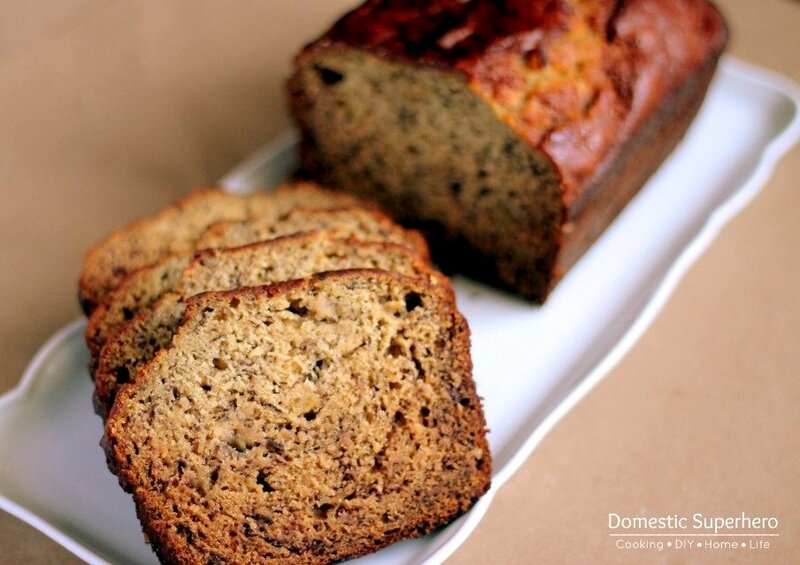 Making the Best Banana Bread EVER is a cinch when you have this easy recipe! It’s only 6 ingredients and can be whipped up in minutes. Feel free to add whatever you like to the bread as well…nuts, blueberries, chocolate chips..they are all great additions. When I was in college there came a day when I felt like I needed to start baking things. I was a nanny for 2 boys who were in elementary school, and they loved eating sweets and baked goods. My go-to was a zucchini bread. Delicious? Yes. Healthy? Um, this could be debated, but I always had an excuse to make it because the vegetable garden yielded tons of zucchini’s every spring…..HUGE zucchinis. I’d make bread for my family, friends, families from the boy’s school…the zucchini was never ending. Eventually I decided to attempt some other breads…how hard could it be? I tried cranberry lemon bread, chocolate walnut bread, pumpkin bread (with chocolate chips, YUM! ), and then finally the simplest of all, banana bread. I tried several recipes until I finally found The Best Banana Bread recipe from Simply Recipes. Moist, banana-y, sometimes with nuts or sometimes without…it was perfect. Hundred’s of loafs and muffins later, I am still using the same recipe. It is so easy and simple, yet so perfect. It can be made in a loaf, a cake, or banana bread muffins…the options are endless. Don’t have ripe bananas? No problem! Try this awesome technique on how to ripen bananas quickly for the Best Banana Bread EVER! Preheat the oven to 350°F. Mix butter and bananas in a large mixing bowl until combined. Add sugar, egg, vanilla; mix well. Add baking soda and salt and mix. Add the flour last, and mix until just combined. You don't want to over mix. Add nuts if desired. Pour mixture into a buttered 4x8 inch loaf pan or muffin tin. Bake for 50-55 minutes for the loaf, or 22-25 minutes for the muffins. Test with toothpick for doneness. Cool on a rack. Remove from pan and slice to serve. Top with butter or cream cheese and enjoy! For a bit of a healthier take, divide flour and use 3/4 cup white flour and 3/4 cup whole wheat flour. Still comes out delicious! Like Banana Bread as much as I do? Check out these other recipes! those look great. I love the little brown cooked strands of fibre and banana you get in things like this – so pretty. I have a lot of old bananas in the freezer and have been meaning to make some banana bread. I always just google the recipe. This time I’m trying yours! Making these tonight! Hubby needs a quick on the go breakfast in the morning and I’ve been on a muffin kick! Let me know how they turn out!! They are always a hit around here! I made these this morning. AMAZING. Seriously. I use a recipe nearly identical to this. I love it. FYI: also makes good banana bread bread pudding! That is so good to know, I have never tried that!! Thanks for stopping by, Kellie! Yum! Thanks! Made both muffins and loaf tonight. We used 3/4 cup of sugar and added both 1/2-1/3 cup of nuts and 1/2 cup+ of chocolate chips. With a little less sugar, they are perfectly sweet. Thanks! This is a good simple recipe. So happy you loved it! It’s crazy how the simplest recipes can sometimes be the best! Thank you for this….I am from snow covered Michigan, but for two weeks i am in heaven!! Out in LA spending some cherished time with my oldest daughter and her hubby and 10 month beautiful grandson. We had a little pile of bananas and I popped onto my Pinterest and searched ‘banana bread’ and yours came up top & center. i hit print and could not believe how simple you made it….I had all of my things lined up and put the mixer away…hahaha So simple and their home is smelling WONDERFUL…..24 min to go! Yummm Thank you again!! What a nice vacation! I am from Michigan too, actually, but now I live in Georgia, where we are currently snowed in as well! 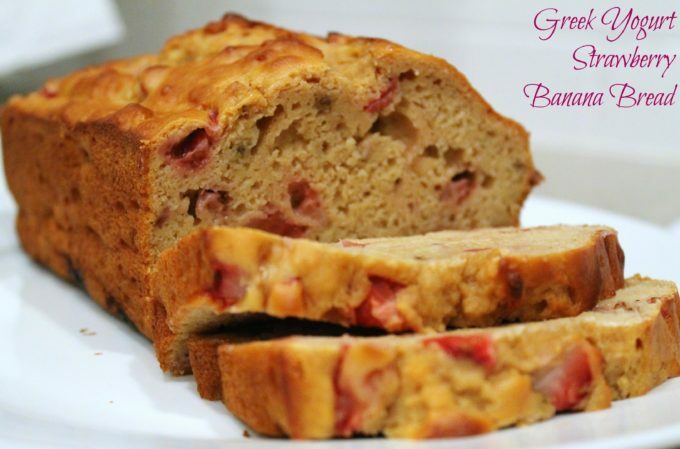 The banana bread is the best ever, I promise you are going to love it! Yes, please do!! It’s the best with a pat of butter! It Really ‘was’ the best Banana Bread Ever!! With butter of course 🙂 They loved it….1 slice each lest for breakfast with coffee in the morning. Thank you again! instead of 1 1/2 cups of AP flour, i used 3/4 cup AP flour, 1/4 cup oat flour, and 2/3 cup whole wheat flour. i also added about 1/2 cup of orange juice (my secret ingredient for banana bread!) and 1 tsp cinnamon. i meant to add flax seeds (i like the texture they add) but forgot them! anyway, the bread came out super moist and delicious, maybe a bit more dense because of the oat flour, but i like the added fiber. Wow! Those sound like great modifications Sam! Nothing like making it a lot healthier! I am happy to hear it came out so well, too. I am going to have to try that! This has become my go to recipe for Banana Bread- so simple- and delicious! I do modify the sugar and add chocolate chips instead of nuts. So happy you love it! We often leave out the nuts too (just because I don’t always have them on hand), and we add chocolate chips too! I actually posted this recipe with chocolate chips as well! So tasty! Thanks for stopping by! Can I make this with my adjustments and still get the great flavor? I don’t use white sugar – I use agave mostly; and my son is a gluten free eater — so we’ll be using a gluten free flour. I sometimes use Bob’s Red Mill products, or I can just make oatmeal flour at home. I’m making this recipe for a second time right now with one small change: I’m making a double batch so we won’t run out so quickly! That’s the best change you can make! I’m pretty sure I’ve used an entire crop of bananas making this recipe over the years. Pulling out two more pans right now! hahahah, me too girl, me too! Found your recipe via Pinterest. Trying this tomorrow. So excited! Slightly off topic but I see you, too, are a nanny. Do you have any go-to recipes for picky eaters? I am a mom of a 2-year old and nanny of two tweens and am always struggling. Thanks in advance! BEST BANANA BREAD EVER!!! I make it almost every week or so and I usually triple it and share with neighbors and friends. Everyone loves it. Yay!! I am so happy that you love it as much as we do! So I just made these today and they are SOOOOO good. 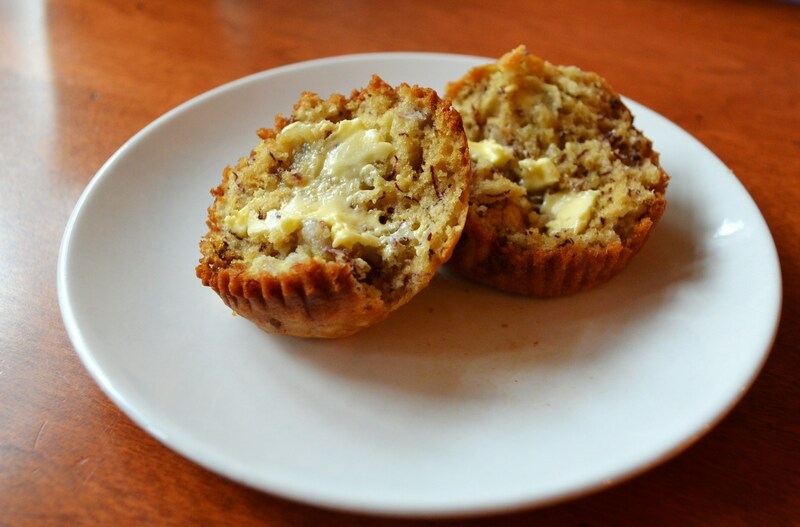 I did muffins, and the tops are just lovely – all caramelized and delicious, and the rest of the muffin is super moist. I used a gf baking mix – just a generic one you find at most grocery stores, and had no issues following the recipe exactly. No need for alterations or expensive gf flours. Thank you for this recipe. It is seriously the easiest and most delicious banana bread I have ever made. It is my go to recipe. I can’t wait for it to come out of the oven, 40 Minutes and counting! I know, right?! I am so happy you like it- definitely a winner over here! I have some ripe bananas in the freezer, I’m going to make this tomorrow I think. I love banana bread. 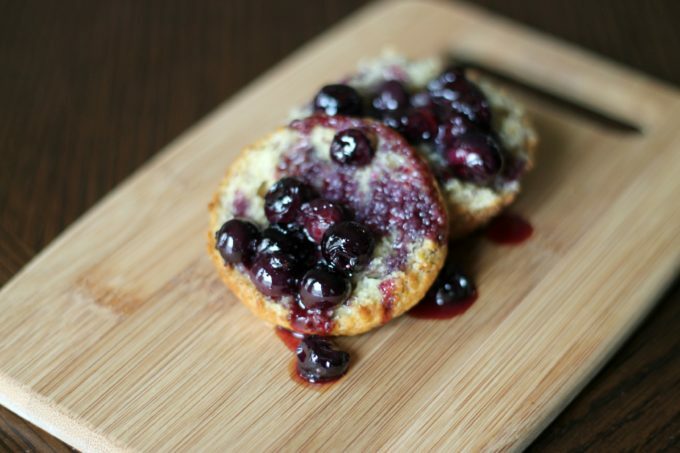 Just made these in a mini muffin tin. SO DELICIOUS! I’m never using another banana bread recipe again. Thanks for the post. I found it on Pinterest. I’m definitely going to follow your blog now. This has been my go-to banana bread for over a year now. I use whole wheat flour, add chopped dark chocolate and cook it in a greased and floured pan, most often a bundt cake pan or recently muffin tin. I’ve tried variations like adding coconut, using olive oil instead of butter, and I am going to try a vegan versions for my vegan friends. It’s serious the best recipe. Love it. Thank you so much, Emily! 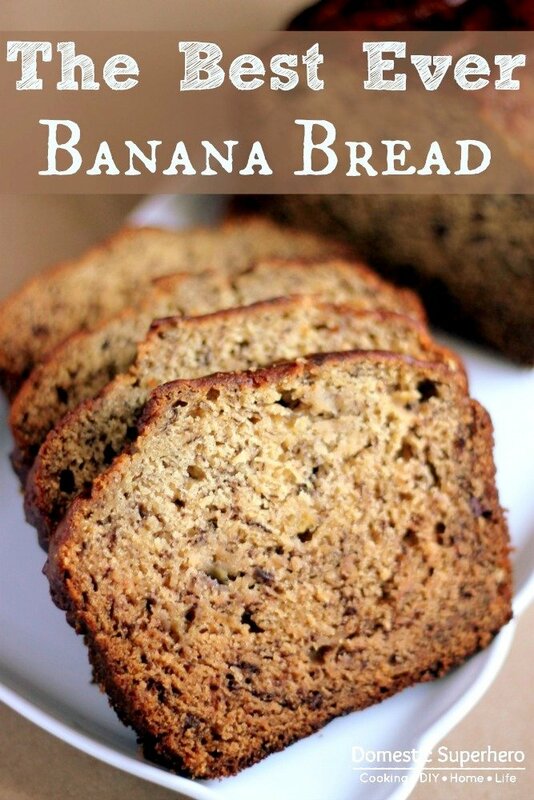 I am making this today because we have some left over bananas and I can’t wait! Gosh this looks so so comforting! This is one of our favorites! My boys actually get excited when our bananas start to turn because that means BANANA BREAD TIME!! 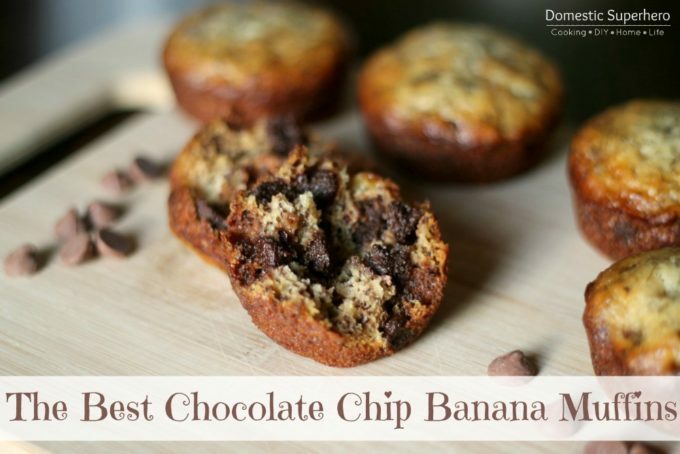 We always have ripe bananas, so I can’t wait to try this! I love a good banana bread recipe! Such a classic, I love banana bread! I love the texture of this banana bread! Yummy! We could make this weekly! It looks amazing! I am so happy to hear that! We love it over here too and it seems like it’s the one thing I have literally been making the same FOREVER!